Find out all the latest news from Citroën in the WRC on our social networks and discover the results of our two crews: Sébastien Ogier / Julien Ingressia and Esapekka Lappi / Janne Ferm in C3 WRC. 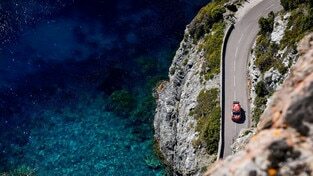 Sébastien Ogier and Julien Ingrassia’s strict determination helped them to secure their third podium of the season in Corsica and Citroën Total World Rally Team’s fourth podium finish in as many races this year. Their hard-earned second place takes them to within two points of the top of the drivers’ World Championship. Meanwhile, Esapekka Lappi and Janne Ferm finished seventh overall, helping to consolidate Citroën’s second place in the manufacturers’ standings and racking up important miles in the C3 WRC at an all-asphalt event. Beginning the day with just a 5.1 second lead over their closest challengers, Sébastien Ogier and Julien Ingrassia immediately secured third place by extending their advantage to almost thirty seconds by the end of SS13, the first and longest stage of the day (31.85km). On the Power Stage, contested in the idyllic setting of the Fango valley against a magnificent backdrop of the crystal blue Mediterranean, the French crew once again showcased their fighting spirit to take the fifth fastest time and collect a bonus point. An unexpected final-stage incident then resulted in them being promoted to second position. They therefore closed to within just two points of the World Championship leader, meaning they won't be opening the road at the next round of the WRC, in Argentina (25 - 28 April). Having struggled with some set-up issues on the opening leg, and unable to make proper corrections due to the lack of a mid-leg service, the six-time World Champions made the best of the situation by ending the day sixth overall, just 10.2 seconds adrift of fourth place. They then produced a heroic effort the next day on both runs on the brand new Castagniccia stage. They used all of their attacking instincts on the dirty, worn roads and their precise pace notes for the first pass at full speed, managing to secure the third fastest time on the first run and then the second fastest time on the repeat. These two performances enabled them to move onto the podium with just the short final stage to go. Finishing as runners-up in the C3 WRC, Sébastien Ogier and Julien Ingrassia claimed their third podium this year from four rallies. Citroën Total World Rally Team has now finished in the top two in all four events this season, with wins at Monte-Carlo and Mexico (Ogier-Ingrassia), and second places in Sweden (Lappi-Ferm) and Corsica. This means the Satory team has now consolidated its second place in the manufacturers’ World Championship standings. Esapekka Lappi and Janne Ferm also struggled with the set-up of their C3 WRC and quickly found themselves in a situation where their hopes of making up ground were remote. 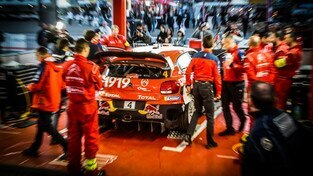 They therefore decided to use the remaining kilometres to run through a range of set-up options on the C3 WRC and add to their experience in the car on tarmac. Their persistence was nonetheless rewarded with a seventh place finish, which also provided a worthwhile contribution to the overall team result. Sébastien and Julien claimed their fifth win in Mexico, after they previously secured victories in 2013, 2014, 2015 and 2018. It’s also the third time in as many rounds in 2019 that Citroën Total World Rally Team has finished on one of the top two steps of the podium. C3 WRC has also made its mark at this event, despite its reputation as a particularly demanding rally due to the high temperatures and extreme altitudes. Starting the day with a 27 second lead over the second-placed crew, Sébastien Ogier and Julien Ingrassia held their nerve despite the pressure applied by those behind. The pair’s controlled performance on the final day saw them secure victory with an extended winning margin after the final sixty kilometres. They also collected five bonus points on the Power Stage with a seventh stage win, making them the weekend’s top performers. It was an excellent weekend in terms of points, as the pair climbed to second place in the World Championship, just four points behind the leader. The six-time World Champions took the lead on the second pass on El Chocolate (31.57km), the most technical stage on day one, before finishing the first leg with four stage wins and an overall lead of 14.8 seconds, despite running third on the road. They were briefly usurped from the top spot the next day when SS10 was red flagged and they were awarded a notional time that took account of the slow puncture they received during the stage. Despite no longer having a spare tyre, the French pair went back on the attack and managed to retake the lead on the next test, Otates, with the second fastest time just 1.2 seconds off the pace. They then went one better, finishing first on the final stage of the morning loop. The afternoon saw them claim their sixth stage win of the weekend, despite the handicap of being the only crew to carry two spares. Their performance enabled them to build up a substantial lead, allowing them to manage the final leg with the kind of control they are famous for. Eleven years after making their World Championship debut here in a Citroën C2 Super 1600, Sébastien and Julien completed their fifth win in Mexico, after those secured in 2013, 2014, 2015 and 2018. It’s also their second win of the season, after Monte-Carlo, and the third time that Citroën Total WRT has finished on one of the top two steps of the podium. Confirmation, if any was needed, of its competitiveness. 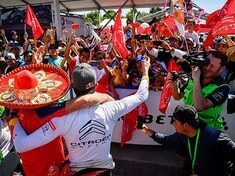 Securing the top spot for the second time in Central America after its maiden win in 2017, the C3 WRC has also made its mark at this event, despite Rally Mexico’s reputation as particularly demanding due to the high temperatures and extreme altitudes. Citroën Racing extended its record at this round to eight wins. On only their second appearance in Mexico, Esapekka Lappi and Janne Ferm quickly showed their undeniable potential. The pair secured a fourth fastest time, 6.2 seconds behind their team-mates on El Chocolate (31.57km), and then a second fastest time (SS7), only two tenths off the stage-winning time on Friday afternoon. They ended the opening leg in a promising fifth position, just 2 seconds behind fourth place. The pace set at the start of the next day confirmed that they were confident in their C3 WRC, but unfortunately a sudden change in grip caught them out and left them stranded by the side of the road. The final leg, during which they were first on the road, provided them with an opportunity to add to their experience, whilst preparing for the next few events on gravel. The point scored on the Power Stage, somewhat against the odds and as the championship contenders also battled for bonus points, served as a timely reminder that they will be a force to be reckoned with for the rest of the season. SECOND PLACE FOR LAPPI-FERM ! Esapekka Lappi and Janne Ferm produced a highly impressive performance this weekend to secure their first podium finish for Citroën Total WRT. 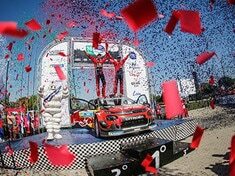 Fiercely holding off the attacks of their competitive rivals during Sunday’s final leg in their C3 WRC, the Finnish duo ended the rally in second place overall. Meanwhile, recent winners of the Rallye Monte-Carlo, Sébastien Ogier and Julien Ingrassia used all of their talent and determination to scoop two bonus points on the Power Stage, despite the disappointment of retiring earlier in the rally. It was clear that Esapekka Lappi and Janne Ferm felt completely at ease during Sunday’s final leg at Rally Sweden this weekend. Much like last year, the Finnish crew remained impressively relaxed throughout the final leg, this time securing an excellent second place with control and authority. This runner-up spot was their first podium finish since joining Citroën and also their best result at this rally in only their third appearance here. This positive result also takes Esapekka Lappi up to fifth place in the championship standings. After winning in Monte-Carlo, it’s also the second podium finish this season for Citroën Total WRT, following a rally during which the C3 WRC stood out for both its competitiveness (three stage wins) and its exemplary reliability. Lappi’s highly promising performance on only his second competitive outing in the C3 WRC followed a rally during which he gradually improved his pace. Fifth at the end of day one, despite a spin that left him having to deal with a damaged aerodynamic package, Lappi then upped his pace on Saturday’s leg. He gained three places, taking him into joint second position, before displaying even more convincing form on Sunday. The Nordic pair started Sunday in joint second with another driver just 2.3 seconds behind, but Lappi landed a telling blow on the first pass on Likenäs (21.19km). On this ultra-fast stage, the 28 year-old driver’s third fastest time put paid to the threat posed by the first of his rivals, whilst adding two tenths to his advantage over the second one. However, he was far from finished. On the second run on the stage, he finished within just six tenths of the stage-winning time to give him a 4.4 second lead over the third-placed driver as he went into the Torsby Power Stage (8.93km). He proceeded to hold onto second overall on the final test and simultaneously grab the final bonus point. Despite the clear disadvantage of running first on the road, Sébastien Ogier and Julien Ingrassia made a fine start to the rally, ending day one just outside the podium places in fifth overall and only 14.4 seconds off the pace. However, first to come up against the water-filled ruts left by the historic cars completing the stages between the morning and afternoon loops, the six-time World Champions were unfortunately caught out on SS6. They became stuck in a snow bank and had to retire for the day. 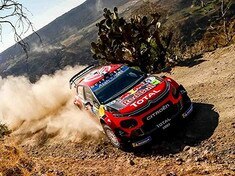 They re-joined on Saturday looking to run in-competition tests and work on the set-up of their C3 WRC. However, they refused to be discouraged and maintained their commitment, managing to claim three stage wins (SS10, SS11 and SS14). The pair then focused on trying to secure a few extra points on the Power Stage, setting the fourth fastest time to come away with two bonus points. Now sitting third in the championship standings, they head for the next round knowing they will have a decent starting position in Mexico. 100TH WRC WIN FOR CITROËN! Sébastien Ogier and Julien Ingrassia produced a heroic effort in their C3 WRC on today’s final leg to win the Rallye Monte-Carlo by the narrowest margin in the history of the event. A winning margin that reflected the intensity of the fight and the performance delivered, a performance that saw Citroën Racing claim its hundredth WRC win at the start of the year in which the brand celebrates its centenary! Tackling the last 13.58 kilometres of a Rallye Monte-Carlo held over some 324 kilometres with a lead of just four tenths of a second calls for one hell of a cool head. And never more so when your concentration has been somewhat disturbed by a throttle issue. With six world titles to their names, Sébastien Ogier and Julien Ingrassia have long since mastered the art of managing the pressure in this kind of situation and the adrenalin pumping through their systems, and they demonstrated it once again today. Second fastest on the final stage between La Cabanette and the Col de Braus, the Frenchmen sealed their seventh overall win and their sixth in a row in the Principality by just 2.2s, on their first competitive outing the C3 WRC! The result also means the pair now jointly hold of the record for the number of wins at this prestigious rally and confirms just how much Sébastien and Julien are already at one with their new car. This exceptional performance is equally Citroën Racing’s hundredth victory in the World Rally Championship, almost twenty years after its first win at this level when the Xsara Kit-Car prevailed at the 1999 Rally de Catalunya, driven by the late Philippe Bugalski and Jean-Paul Chiaroni, who now works as recce and weather coordinator for the team. A historic achievement that reflects the kind of longevity at the highest level that few manufacturers can boast. All too aware of the pitfalls invariably provided by Monte-Carlo, the French pair adopted a measured, intelligent approach from the outset, grabbing second position after Thursday’s opening two night stages. They then moved into the overall lead the following day in the afternoon (SS7), thanks in large part to two stage wins (SS5 and SS6) on Curbans – Piegut (18.47km) and Valdrome – Sigottier 2 (20.04km), both new stages this year. Having ended Friday’s leg with a narrow 2.0s lead, Sébastien and Julien managed to more than double their advantage on Agnières en Devoluy – Corps (29.82km), the opening speed test on Saturday and the longest of the weekend, and this despite the stage featuring plenty of ice. A lead that they managed for the rest of Saturday’s leg, meaning they began the final day 4.3s ahead of the second-placed crew. They traded blows with their closest challengers on Sunday’s short final leg before pipping them to victory in the last few hundred metres. Meanwhile, although they were forced to retire on Saturday morning after an engine issues, Esapekka Lappi and Janne Ferm had nonetheless made a promising start to the race, holding a brilliant fourth place on Thursday evening. Clearly, Citroën Total WRT made the right call in deciding to add them to their driver line-up, alongside Sébastien Ogier and Julien Ingrassia. Given that they are also likely to have a good position in the running order in Sweden, they will undoubtedly be a force to be reckoned with again.